The new Ask A Stylist section of Stitch Fix Style is your go-to resource for every fashion dilemma. Our Stitch Fix Stylists are already trained in the art of style—they’re sharp, creative & naturally ooze chicness. Now you finally have direct access to them! 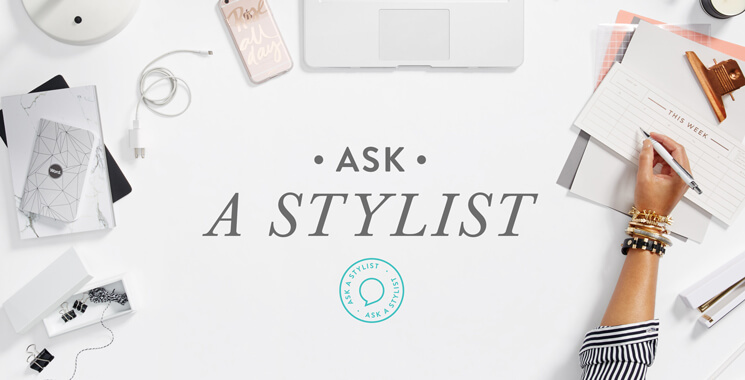 In addition to asking a question whenever a fashion emergency (or simple question) arises, here are a few cool ways to use Ask A Stylist. Receive something in your Fix that you’re not entirely sure how to style? Head straight to the source & ask a Stylist how to wear & pair it with pieces in your existing wardrobe. Does this new top go with these trousers I already own? Does this fit me correctly? Take a photo, upload it with your question & a Stylist will reply ASAP. Have an upcoming hot date, job interview, vacation or high school reunion, for example? We’re here to help! Tell a Stylist what event you’re planning for or ask if something’s appropriate, and you’ll receive personalized, expert advice in a flash. Simply stuck in a fashion rut? Ask a Stylist how to try a new trend or mix & match pieces you already own. It’s the quickest way to refresh your everyday wardrobe! Need workwear recommendations? Simply tell your Stylist your office dress code & she’ll send inspirational outfit suggestions. Browsing the Inspiration Gallery & want to know more about an outfit or style? Or how to tailor a trend to your personal style? Try it out! Our Stylists are standing by to answer all your fashion questions.